The recent increase in car parking charges has caused an uproar amongst some villagers and visitors to our village, others have expressed some concern at the increase, there are those who are indifferent and a few who actually agree with it. Not surprisingly this varied reaction is also reflected amongst the members of the committee. It is in fact the sort of reaction one will find in any society or group of people. That is not to say that those who object to the event, in this case the increase of charges, should be ignored. Ideally the community should have received notification and an explanation of the increases before they came into operation. I apologise for this omission and hopefully such a thing will not happen again. At the last committee meeting it was decided that the PIC activities and involvement in the village should be reported in the Parish Tram. This should help residents of Portreath to understand why some things seem to happen without any apparent reason. It may also encourage residents to put themselves up for election to the committee at the AGM each January and so help our community. it is worth pointing out that there is a village hall, playing field with equipment for the children of the village, a bus shelter, a number of small gardens about the village, a number of benches in the village and surrounding countryside. All this has to be maintained and at times repaired or replaced because of damage by villagers or visitors to the village. Last year we paid part of the cost of removing silt from the harbour, we made a number of donations to village organisations for specific purposes (some requests were turned down as requests are not automatically granted). It seems that people do not think twice about dropping litter on village streets, we pay for this to be picked up. Greenfield gardens have been rebuilt and will soon become the responsibility of the PIC. The maintenance of this will increase our outgoings in the future. Indeed any additional facility provided increases our annual costs. Now back to the parking charges. The decision to increase, and the scale of the increase, was not made by the PIC, it was made by the directors of PAL the company that manages the car park. Three of the five directors of PAL are appointed by the PIC. At board meetings these three directors have to consider the commercial needs of the company as well as the position and needs of the PIC. There are times when these may seem in conflict and judgements have to be made. The reason why a decision on charges had to be made was that as a result of increased use of the car park the turnover of PAL had reached the level at which the company was legally required to register for VAT. The effect of this was a 17.5% tax on the car park income which would flow through as a reduction, by the same amount, in the PIC income. VAT is a sales tax and is passed on to consumers. The increase was more than the 17.5% lost to VAT but it was thought that the additional amount should give the PIC a little more revenue to carry out its obligations. It was felt that the car park was still an attractive proposition for beach users. Those who feel that this is not justified because Portreath has nothing to offer, or it is detrimental to local business, should remember that the car park is adjacent to the beach which is very convenient for beach users. It is a beach car park and if people are on the beach they are likely to use the local shops and, importantly, the income from the car park is for the benefit of the village. For village inhabitants who want to use the car park the answer could be to buy a season ticket which allows parking all year for as long or short a period as you want. All the representatives were able to give very favourable positive reports on the many Village organisations. Both the County and District Council Reports were also very positive, intimating a very progressive future for the Parish. of a Designated Public Place Order for the coming holiday season which would give the Police powers to prevent the consumption of alcohol in designated areas within the Village. The Chairman also confirmed that funding of £360,000 has been awarded under the Mineral Tramways Project, towards improvements to be made in The Square, along Beach Road and the sea front car park - this part of the works has already commenced in the provision of new railings. At the annual Meeting of the Parish Council also held on 15th May Councillor Watts was re-appointed as Chairman for the coming year and Councillor Mrs. Butler was appointed as Vice Chairman. Work on the upgrading of Greenfield Gardens has now been completed and a very successful 'Planting Day' was held on 22nd April when plants purchased from The Kehelland Garden Center were planted out by volunteers under the supervision of Councillor N Mathews; Ms. S. Clasper, Mrs. R. Varranneman-Eyre and Mrs. P. Krist. The seeding of the grassed areas has been carried out by the Contractors, R.H. Olds of Roseworthy, and, with the recent rain, it is hoped that the grassed areas will soon be ready for the first cut. It is anticipated that an Official Opening Ceremony will be arranged later in the season. A presentation was made to the Members of the Lottery Funding Board on 21st May by the Councillor Watts, Chairman of the Council; Mr. D. Coates, the Chairman of the Harbour Association; Officials of Kerrier District Council and Cornwall Enterprise Ltd. Other Harbours involved in the Funding Application were also visited by the Lottery Board Members but the Portreath application is the only 'community based' proposal included in the application for funding. 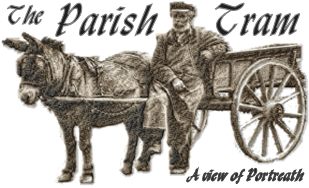 An order has been issued for the trimming of the footpaths within the Parish and this work will commence shortly. On Saturday April 1st Cornwall Wildlife Trust's junior members and their friends cleaned the beach at Portreath to find out what rubbish had been brought in on the previous day's high tide. 34 children and 32 adults worked from the strandline up to the top of the beach and found a variety of objects, ranging from small pieces of plastic to a huge entanglement of rope and fishing net (see photo). In total, 8 bags of rubbish were collected. The families recorded the debris found on a special chart provided by the Marine Conservation Society as the results were to be sent to the MCS for inclusion in their national beach litter survey (see attached report). This beach has been cleaned by CWT for the last 3 years and after the event last year a letter was sent to the café owners, detailing the amount of plastic spoons found on the beach. Possibly as a result of this there was a noticeable drop in the amount of café-based debris this year. After the beach clean the children and their friends were led on a Rockpool Ramble by Treve Opie from Cornwall College, and they were able to see sponges and anemones not usually visible but made accessible by the extreme low tide of the day. These families came from as far away as Tintagel, Newquay and Porthleven; and for some it was the first time they had been to Portreath, although many said they would visit again in the future. Even some local kids who had come to surf joined in, and a good time was had by visitors and locals alike. WELL DONE PORTREATH BROWNIES ! Following the Brownies success in winning through to the final of the Halford Trophy, I am really pleased to report that following a fantastic competition, which all the Brownies really enjoyed, we came second – by 1.5 points ! The Final took place on Saturday 24th May at Penrice School, St. Austell, and we all travelled there together on a mini coach due to the kindness of the Portreath Improvements Committee paying for our coach. This certainly helped team spirit as they sang songs most of the way there and most of the way back ! We had a picnic lunch together once we got to Penrice and the competition started at 2.00. They had six challenges, which were all based on a water theme. All the children who attended were winners in their own right anyway having got as far as they did in this three yearly competition, so the final results were naturally close – the difference between the winning and losing Units was only 8 points ! Both the PIC and the Guiding Association offered to treat the Unit to a fish and chip supper on the way home, and although it wasn't possible to stop on Saturday evening, everyone can be assured the Brownies will be getting a very tasty treat for having done so well. Thank you to everyone who supported us in this memorable event and well done to all the girls who were such good competitors. I am pleased to be able to report that since the last edition of ‘the Tram’ the policing of Portreath and Illogan has been boosted by the allocation of an extra resource. Police Community Support Officer Vikki WHITE has now joined me and will become a familiar sight in the village. Up until earlier this year funding arrangements meant that Police Community Support Officers (or PCSO’s) were not able to work in the area. Fortunately due to a change in the way that they are funded this has now changed. Vikki’s presence within the local area represents another positive step in our efforts to improve the overall policing service that is provided to the village. She is very keen to meet with as many Portreath residents as possible and to work with the council, school and other groups to help improve the quality of life for all. A message that I would like to convey is if you see Vikki or myself out on patrol - don’t be shy! We will always be pleased to speak with you - whether it is because you have an issue that you would like us to try and resolve or you just feel like having a chat - we will be delighted to meet you ! I would like to say a big thank you to those members of the community that helped with setting up and decorating the police office. It has certainly made it far more user friendly. I have now held two surgeries within the new office – the response for the last one was a little disappointing – although I can’t blame anyone for choosing to go down to the beach as it was an exceptionally hot day ! The next surgery at the office will be held by Vikki on Saturday 22nd July 2006 from 2.00pm until 3.30pm.